Bitcoin Forum > Alternate cryptocurrencies > Announcements (Altcoins) (Moderators: mprep, Welsh) > . A phasing transaction was created to pay for ROKOS integration. Up to 4M HZ (1 BTC) will be sold when holders with a total of 200M approved. If you want to approve, search for transaction ID 17360318482821505195 in block 605487, go to actions and click approve. I have voted by following your directions, and hope other HZ holders will too! How was 200M chosen? It seems rather a lot. And is there a good way to track the progress of voting? Thanks! ░▒▒▓▓▓ Emercoin ▓▓▓▒▒░ ▪ EMCSSH ▪ EMCSSL ▪ EMCDNS ▪ INFOCARD ▪ MAGNET ▪ EMCLNX ▪ EMCDPO ▪ Innovative blockchain services for business and personal use. ~360M are on exchanges, 40M in the foundation, makes 600M which could vote. This is the first time we use this method, and as it's about 10% of the foundations' funds we didn't want to set the number too low. If it fails, and we didn't hear voices against the integration, we can try again with a lower value. But it's looking good so far, 94M approved already. You can check the status by logging in with the HZFoundation alias (at the login screen, remove the NHZ-**** preset with backspace and type it there). HZxchange.net is back up, listing only some trusted assets for now. Coins will be added during the next days. There have been 158 trades, 24 transfers, and 37 accounts are shareholding. Thx to you all! For more infos, visit the new hzcharts, and the block explorer. And the reopened hzxchange. Stay tuned, for big news! Wishing your asset a happy birthday, and may all your present and future projects be a success! Happy birthday. I try to buy more. Wow, so much loooove. I am moved. Happy that I had crossposted here. Thx guys! I have now just successfully finished an essential step. Quite a task, that I have created for myself :-) But I do love data work, actually. Keep tuned . Your hope is not in vain Emerger - I have carefully considered the phasing and have added my voice to this important matter and I can tell you that this (voting/approving) is exactly (to a certain degree) what is necessary for the success of the HZ exchange so it was a tremendous privilege for me to be part of the truly pioneering phasing tx. Now I too hope with you it comes to fruition. We submitted our PR for Azure yesterday. Zen (from Blocknet community) is handling this for us in between his day job, so it could be a few days, but this is the first step! 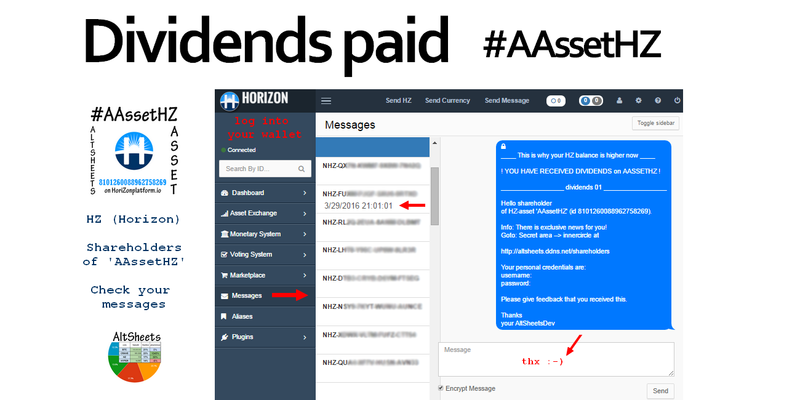 I have sent 37 individualized messages to all #AAssetHZ shareholders. a detailed 'newsletter 05' is giving background infos about these dividends. If you can, buy (more) AAssetHZ (8101260088962758269). Thanks. Where can I lease my HZ guys? Did anyone not approve for a reason, please tell us here. Until now there's only been positive feedback, so when it isn't approved we'll assume that the threshold may have been too high. Log in to your account, use the search box in the top left corner to find transaction 17360318482821505195 and approve in the actions tab. New Service for HZ ! A while ago, testdruif asked for opinions on a new service he was building. to develop it further, contributed ideas, and helped debugging it. And - yiehah - I could convince him - to port it from Txt to HZ. and you choose which type of transactions you want to get notified about. --> Notice PMs before they are already pruned again. --> Add your ideas. Many good purposes for this. --> Anyways ... isn't it great? Happy. Best new service in a while. 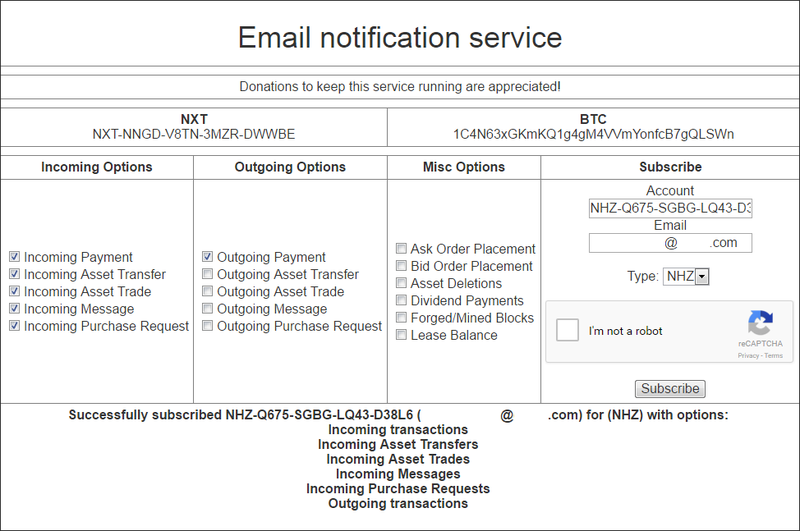 --> "Email notification service for various transactions" (in nxtforum). Send donations to his addresses. He has also added a HZ address now. EDIT 1: new domain name, and HZ donation address. Approved. Sorry for the delay!